Did you know that over 80% of the population has some form of gum disease? Gum disease is the leading cause of tooth loss in adults worldwide. Its treatment and control is the single most important factor underpinning all aspects of dentistry. Gum disease is caused by excessive bacteria building up in the mouth. This bacteria and its by-products are called plaque which if left in the mouth too long harden into scale called calculus or tartar. If you don't remove the plaque, your gums become swollen and bleed easily. This can cause pain and infection in your mouth. If the gum disease progresses your gums detach away from your teeth to form pockets or gaps between your teeth and gums. These pockets cannot be cleaned at home and tend to become infected with more bacteria. Gum disease can be incredibly painful and if allowed to progress it can cause destruction of the underlying bone, recession of the gums and ultimately the loss of the tooth. Studies have also shown that bacteria found in gum disease are also found in heart disease and therefore may have serious health implications. Regular removal of bacteria, plaque and tartar professionally by our hygienist is essential to maintain healthy gums. 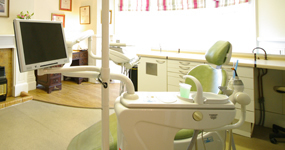 Excellent homecare is also vital, which will be demonstrated by our hygienist.